In recent news, this weeks job numbers are in. . . Jobless claims are down, hiring is up… Blah blah blah. Not sure about you, but I am a frequent listener of NPR. Therefore, I hear that bit about job/joblessness numbers every week. I hear about how numbers are either up or down, I hear the different interpretations; Democrats applaud the good numbers and Republicans seem to scoff at them and state that they aren’t that good. Not matter what though, people are working. People are working, but what is it that they all do? On your morning commute do you ever wonder where all those people are going? I was able to parse from everyone’s attire, while getting gas this morning, that everyone at the station was going to some type of construction job except for me. I was the odd man out, with my slacks and tie. There was actually a couple of odd stares. In all this wondering about what people do, the follow-up question (in my mind) is do they enjoy it? I’ve always thought there to be a difference in types of work people do; there are careers and there are jobs. I sometimes think of careers as the work people do that they are pa ssionate about and jobs something that you do to bring in the money. That definition for me was shifted when I saw the news about James Robertson and his amazing commute. His commute to something that I would have considered a job. But what happens when a person works a job (not a career, that social construction that says meets all these standards) and they are simply passionate about working. Putting their hands in motion to create, build, clean, polish, cook, push, pull and whatever else. 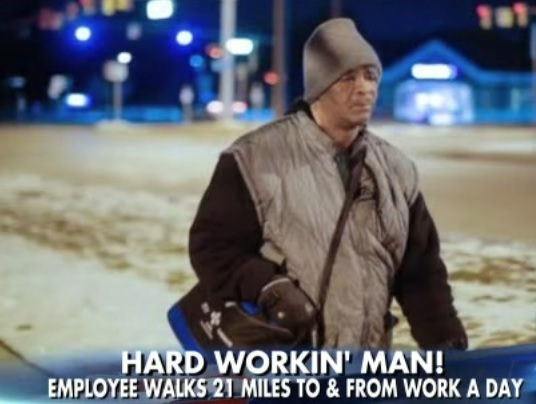 This man (of men) was so passionate about working that he commutes over 20 miles, most of which is on foot. Yikes! As I sit at my desk, with my ergonomic keyboard and mouse, plush seat and carpet under foot… I wonder… would I walk over 20 miles to work at a place that I consider a career? Likely not. It isn’t because I’m averse to walking. I’ve done a 20 mile commute before (once): forgot my wallet and walked from Downtown Chicago to Irving Park. Okay it was more like 12 miles… Still the point is I have no desire to ever do it again, and cannot imagine doing it with my current “career”. So, we have this man who is very much my senior at 50 years of age does, his commute 5 days a week to a place that I thought was “a job” and his employer also states that his attendance is impeccable! Makes you think, if it is all about passion, who really has the career? Isn’t it interesting how hard we fight for the things we want. How they can be so close that you can see it, feel it, hear it, taste it. And how easy we can lose them… Sometimes they are taken from us and other times we give them away. The Superbowl wasn’t a let down, it was a life lesson.